Don’t let a small space like a small apartment deter you from creating a beautiful Thanksgiving. That’s my suggestions for us small space dwellers. If you’re not traveling to mom’s; or if mom’s coming to your place; or if you simply want to create a beautiful Thanksgiving dinner for friends; or for youself. Start with the idea that Thanksgiving is going to be great and you’re going to make it so! Even if the challenge of cooking a perfect meal seems scary, make a great Thanksgiving. Start with the door. Greet everyone (and yourself everytime you return home) will a lovely door wreath. I do believe in door wreaths. They’re the first introduction to the world of just how wonderful you are! They warm the attitudes of guests and put smiles on their faces before you even open the door. You can purchase a beautiful wreath or make your own. A door wreath doesn’t have to be elaborate, even something simple and with warm colors can make a lovely statement. Create a menu or a draft menu. This will help you decide how many dishes, platters etc. you will need; how much space you will need; where you will set up the food; and yes, as crazy as this may sound, the colors and decorations. Decide on the colors you want to use. Add the hot and bright colors, such as oranges and reds. Or use neutral colors with earth tones and just a little warmth. In the image below, note how the lit candles add more warmth to a neutral display. Display a grouping of fall elements as a centerpiece or vignettes in other parts of the apartment. 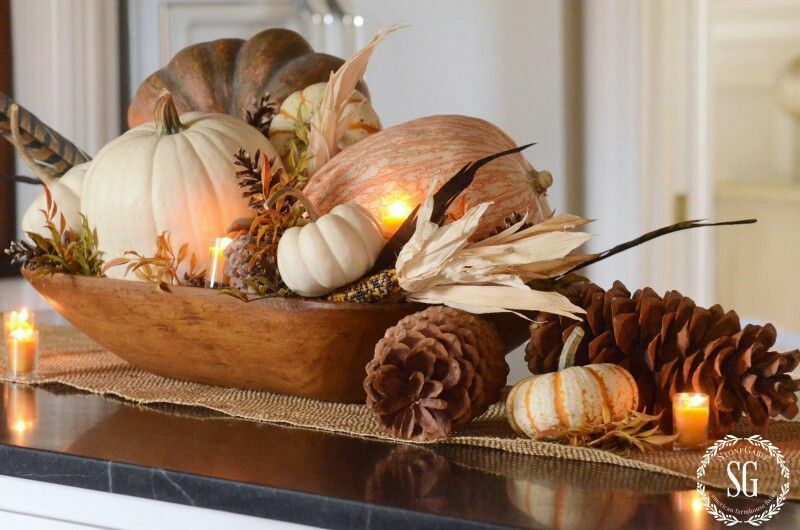 Pumpkins, Indian corn, acorns and cones with a touch of green is perfect on the living room cocktail table. A simple single centerpiece overflowing with florals, twigs and greenery make a bold presence in small living space. Groupings of dinner and flatware and glasses set among iterated decorating items become a conversation topic among the guests, as well as avoid visual clutter. You may not have a small space kitchen as lovely or even as spacious as the kitchens in the images below. Still, it is possible to create a beautiful buffet on a kitchen counter. Clear the countertop of anything not needed for serving. If your countertop is a bit tacky, cover it with a lovely tablecloth or fabric or even heaps of gauze. Squeeze in a vase of flowers and lit candles. Use varying heights of serving dishes. If you don’t have beautiful serving dishes, go ahead and mix them up but where possible add a paper cover under the food. Set a beautiful table. It doesn’t have to be elaborate. Often less is more. But add at least one statement element, such as a lush centerpiece. In the tablesetting below note the abundance of greenery and candles on a rustic table. Have fun with place names. If it’s just the two of you or perhaps four, of course you don’t need them. But how about adding place names anyways with a lovely note written on the place name and your appreciation for that person or an appropriate proverb. Don’t shy away from adding a tablecloth! They’re timeless, whether you purchase a tablecloth or use even a blanket or layer large pieces of fabric. And finally, give your guests a chance to express what they’re thankful for. Add a place for a note or create a placemat or circulate one decorative sheet of paper or even allow guests to write on a tablecloth you bring out every year. It makes for a great conversation topic! Small space living offers a wonderful opportunity to create a great Thanksgiving celebration. It also adds precious intimacy. Make planning and executing your plan a fun process. Then wow yourself and your guest with the beautiful and wonderful aromas of Thanksgiving traditional or non-traditional dishes. 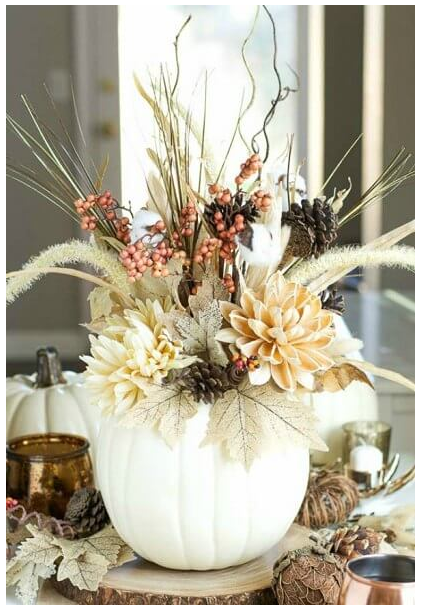 Bring in fall colors and elements, dazzles with lit candles, flowers and even some glitter.